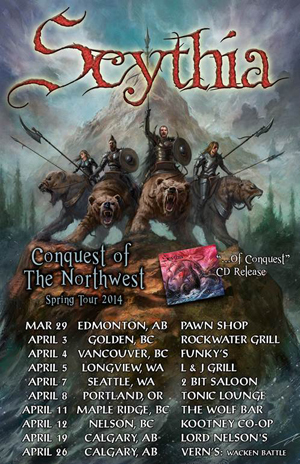 Vancouver, BC folk/power/progressive metal band SCYTHIA’s upcoming trek, dubbed the “Conquest of the Northwest” tour, kicks off in Edmonton, AB on March 29th! The tour hits ten cities in the U.S. and Canada, running sporadically through April 26th in Calgary, AB at a battle for Wacken at Vern’s. See the tour poster or the listing below for a full listing of dates, and head out to hear new tracks and old favorites! SCYTHIA’s new album, …Of Conquest, is out now! You can order …Of Conquest at http://scythia.bandcamp.com/releases. The album, which in addition to power and folk metal influences also includes hints of progressive and death metal. The album was engineered/produced by Lasse Lammert (ALESTORM, GLORYHAMMER, HALCYON WAY, SVARSOT) at LSD Studios in Lubeck, Germany, with co-production by Shaun Thingvold (STRAPPING YOUNG LAD, LAMB OF GOD, FEAR FACTORY). The album was mixed by Nino Laurenne (ENSIFERUM, WINTERSUN, KIUAS, FIREWIND) at Sonic Pump Studios in Helsinki, Finland. Mastering credits go to Svante Forsback (RAMMSTEIN, FIREWIND, KORPIKLAANI, APOCALYPTICA) at Chartmakers in Helsinki, Finland.